374 pages | 11 B/W Illus. In the last two decades public policies have reflected a drive for accelerated global economic integration ("globalization"), associated with greater economic liberalization. The outcomes have been largely disappointing, even in the estimate of their designers. Rural livelihoods have become more insecure, and the expected growth has rarely materialized. Insecurity is also etched into the growth of informal economies across the world. Yet the economic policy agenda that has been so adverse to many people around the world has also provided new opportunities to some social groups, including some low-income women. In response to widespread discontent with the liberalization agenda, more attention is now being given to social policies and governance issues, viewed as necessary if globalization is to be "tamed" and "embedded". 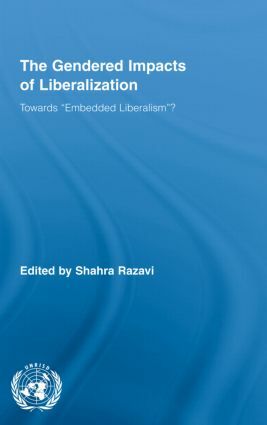 The contributors to this volume address key issues and questions such as whether states have the capacity to remedy the social distress unleashed by liberalization in the absence of any major revision of their macroeconomic policies and whether the proposed social policy reforms can redress gender-based inequalities in access to resources and power. Shahra Razavi is Research Coordinator at the United Nations Research Institute for Social Development (UNRISD), where she oversees the Institute’s Programme on Gender and Development. She has conceptualized and coordinated global research projects in a number of areas, including Agrarian Change, Gender and Land Rights; Gender and Social Policy; and The Political and Social Economy of Care. Her recent books include Gender and Social Policy in a Global Context: Uncovering the Gendered Structure of "the Social", edited with Shireen Hassim (Palgrave, 2006); Agrarian Change, Gender and Land Rights, special issue of Journal of Agrarian Change (Blackwell, 2003); Gender Justice, Development and Rights, edited with Maxine Molyneux (Oxford University Press, 2002). In 2004–2005, she coordinated the preparation of an UNRISD flagship report, Gender Equality: Striving for Justice in an Unequal World, which was the Institute’s contribution to the "Beijing+10" process.